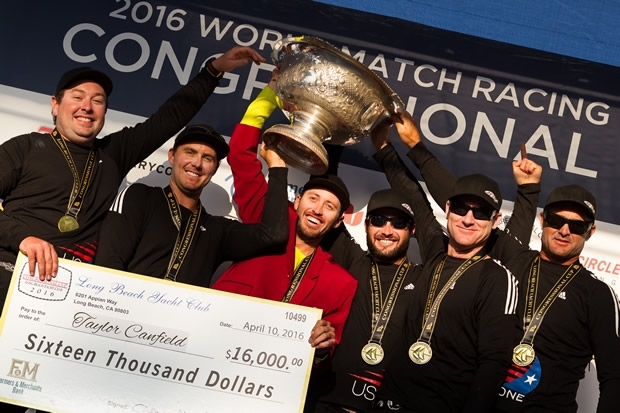 Taylor Canfield and his US One Sailing Team triumphed in the Congressional Cup, stage two of the World Match Racing Tour, after five days of unbelievable match racing – making him the first skipper to win three Crimson Blazers back-to-back, in the 52-year history of the legendary regatta. The five-day World Championship event had been beleaguered with unseasonable weather: light and shifty breezes, rain, and calms. That PRO Randy Smith and WMRT Racing Director Craig Mitchell were able to pull off the series, was a near miracle. The repechage was terminated; series were shortened to first-to-two. But the racers were unflappable, and ever favourable about their participation in the Congressional Cup; known as the ‘granddaddy of match racing’ and a gateway to the America’s Cup. And finally today, Long Beach delivered. The steady breeze and sunshine this world-class venue is known for arrived, just in time for the Semi Finals and Finals Sunday. Canfield beat Semi Finalist Scott Dickson (USA) in three successive matches, racing so close to the spectator-lined pier, that Dickson’s spinnaker grazed it; earning him a penalty he couldn’t shake. At the same time Sehested was duelling Sam Gilmour (AUS) in a breathtaking Semi Final series that went to the full five matches. The legs were short, to ensure completion of the series; providing few passing lanes, but plenty of excitement. The Congressional Cup had entered a new era of competition, with exhausting, aggressive pre-starts crammed with headsail changes, luffing and tacking duels galore. Gilmour defeated Dickson, to take third place in the event. “This is probably the best regatta I’ve been to in the world,” Gilmour said, speaking of both the level of competition and hospitality. In the first of the Finals, Canfield defeated Sehested handily, with a thirty second lead. It looked like the two-time defending champion had the title sewn up. But in the second match, Sehested retaliated, crossing the finish line three seconds ahead of Canfield. And as he rallied strong in the final sudden-death bout, it appeared that Canfield had met his match. Sehested led his rival by mere seconds around the course, then Canfield hit the leeward gate, and was flagged. Pressing up the course, he continued, “We had nothing to lose, so we parked it up at the top mark.” They luffed Sehested. “The execution was spot on, and Nicolai made a small mistake,” Canfield said, a penalty that scrubbed Canfield’s. “At this level. you make an error and your competition takes full advantage of it.” Back in control, Canfield kept Sehested pinned, saying, “I was very confident on that last run, that we were set up to hold them out at the pin end.” US One Sailing Team shut the door on Sehested, took the match, and the Congressional Cup. Canfield was greeted at the Long Beach Yacht Club by his dad, Bill, and girlfriend Stephanie Roble, 2014 Rolex Yachtswoman of the Year. Wearing an ISV flag like a cape, he looked a bit like a super hero: a super hero drenched in champagne. The World Match Racing Tour now moves on to Copenhagen, Denmark 9-14 May where the battle will restart for the 2016 World title.